Our health is our largest property – Start now learning! Make sure that you have enough space for every participant. Make sure that environment is safe. Have the whole class take the stage. The Facilitator describes to the group the movements of each and launches appropriate music (simulating jungle, forest, field, sea). The first step – the facilitator tells each participant that they will have to imitate different movements of animals from all over the world. It will be a super fun creative and innovative. Let’s start with Bull – lean forward, put both hands on your head like bull horns, walk slowly and dangerously. Then say slowly “Moowou”. Next step is to imitate Eagle. Spread your hands and fingers aside in the shape of bird’s wings, pretend to fly like an eagle and occasionally waving your arms like eagle wings. Every 2-3 seconds make a scream like an eagle. The next step is to imitate a Horse! Each participant puts his palms, fingers and hands in front of his chest, starts to bounce quietly and slowly on the spot and every 5-6 seconds makes a sound like a horse. The next step is to imitate Swordfish. Each participant stretches his fingers out of his body (like a swordfish) as far as his body and begins to swim slowly among the other participants. In every five seconds the participant jumps high, imitating jumped out of the water swordfish. The next step is to mimic the Frog. Put your hands on your hips, and start bouncing around the other players. Make sounds like a frog. Try to get each participant and tell him “Quak”. Let’s now mimic a hungry and dangerous Wolf. Swing your arms and fingers like claws of a hungry wolf and begin to stalk other participants. From time to time make the roar of the wolf. The next step is to imitate Crocodile. Stretch one hand to the front of the body and put another one on it. Now you have a crocodile jaw. Let go slowly among the other participants. Slowly dissolve your hands (one hand down to the ground and the other to the top to the ceiling) to mimic a crocodile jaw. Try to catch half of the participants with your crocodile jaw. Than continue to imitate – rabbit, monkey, chicken, shark, giraffe, kangaroo, duck, bear, snake and so on. 3. Let’s play again one more time. Materials: sheets, pens, flip chart, PC, tablets, smartphones, etc. What is a health promotion (foods, drinks, recreation activities, еtс.). Who should be concerned about (people at risk, people from developing countries, poor people, people with physical or mental problems, refugees, еtс.). What it should be about (the risk of unhealthy food, the lack of drinking water, the risk of a health crisis…). Where should health promotion take place (only at local, national or European level, everywhere…). By whom or what organization should be held (only by the authorized authorities of the state, by all, only by the red cross, only by the affected and their relatives). When should it take place (before, during or after the end of health or humanitarian crises…). Some examples of good practice. Ideas for health promotion in kindergarten, school, workplace, university. The Facilitator starts the discussion and writes on the flip chart all feedbacks from the presented information, opinions, recommendations, ideas, questions from participants. Brainstorming effect is welcomed on the main topic – our health is our largest property and participants start throwing ideas and to discuss and debrief every possible aspect of the topic. At the end, they all have a look to the flipchart where their thought and ideas are visualized. Make sure that each participant can freely speak on the topic. Make sure that any opinion, idea, question or opportunity is recorded. The Facilitator splits the group into two teams A/B and give them tasks. Create a healthy event targeting adults. After the expiration of the deadline, each team presents the work he has done for around 10-15 mins. After the end of each presentation, each team will have time to ask or answer of the questions. Please find the differences in the approach that you used to create campaign with the different target groups – young and adults? Which one of the target groups was easier to be created a campaign and why? Materials: sheets, pens, flip chart, Wi-Fi, PC or smart phones, markers, coloured cones, balls, ropes, bands, bibs, rods, ladders, strips etc. Every team has 30 minutes for preparation. After the expiration of the deadline, each team presents the work it has done for around 5-7 mins. Each team can invite the other team (if they wish) to join for their presentation and/ or demonstration. The Facilitator writes the rules and the description of each activity to a flip chart. Make sure that you have enough space for demonstrations. Make sure that rules and the description of each activity is recorded. Explain with one word why health is our largest property? Explain with one word an action that you can take to save your health. Who can practice sports (оld people, disabled, refugees, homeless, poor, sick, people of different ethnic, people of different races, men, women, children)? Which sport is best for you? Participants have 15 minutes to pass through all the flipcharts and to write their message and they can use the Module’s infographics and connect them to the questions on the flipchart. "12 tips to be healthy"
Participants will be asked to share on social media at least 3 videos raising awareness on health importance, healthy habits and prevention methods. 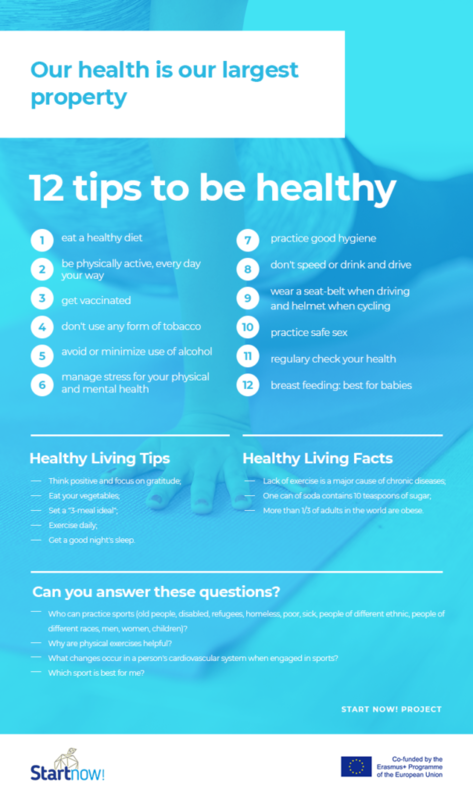 As a source of inspiration can be used Module’s infographics and connected the information that will be shared to “12 tips to be healthy”. They can also share the videos in a community groups or pages at local level and aiming to reach as many people as possible – to ensure that the videos and accompanying posts are attractive, creative and innovative. All of the posts will include the “Start Now” hashtag and will promote active lifestyle. Appendix 1: "12 tips to be healthy"